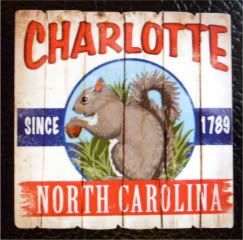 Bought this magnet at the Charlotte airport, and had to use it for today, since yesterday we passed Chapel Hill on our way to Durham (Yeah, Duke - don't ask, I still don't know either). The squirrel - docile here though it is - reminds me of when I first got to Carolina. I was headed to class, and right beside Phillips Hall, one of the sciences buildings, I noticed two squirrels chasing each other around. I mean, if there's anything UNC has more of than Duke-haters, it's squirrels. I mean, they're everywhere. So I stopped to get out of the squirrels' way because they were going pretty hard - they ran around for a bit, and then ran up a tree a little out of sight. I hear a bit of a kerfuffle in the leaves, and then all of a sudden, BAM! The boy squirrel - and a branch! - came flying right out of the tree - right into the sidewalk in front of me! You know what? He kept right on moving, too - didn't take a second look back at the scary girl squirrel who threw him out of the tree. Don't tick off a squirrel, they will kick your asses right to the curb. Literally. I have never heard you tell this story. Did you jump a mile off the ground as usual? HEEEEE!